Conforming with the cascade of skyscraper projects advancing in the city – particularly in the booming Dongcun district – [building] blends a keen sense of functionalism with a gutsy, emboldened design that is set to rise above the rest. 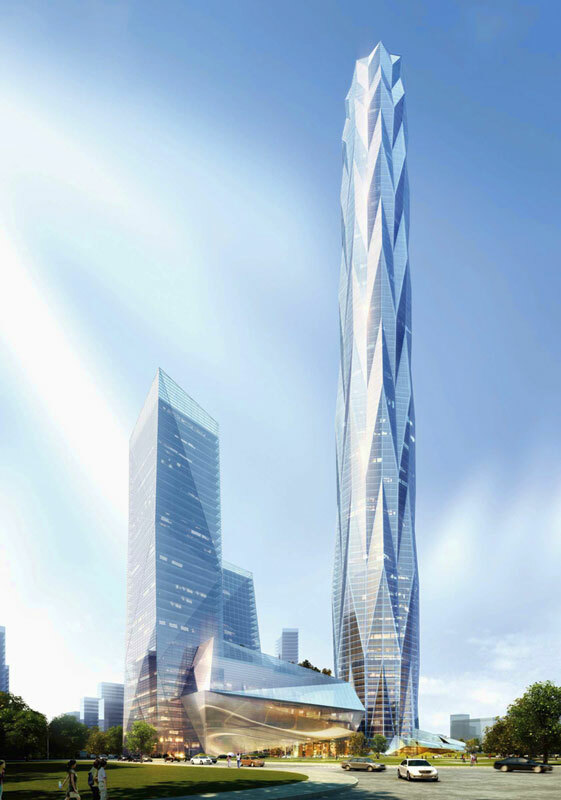 The tower forms a central component of a larger complex, Chengdu Greenland Center, which will consist of: a retail podium, complete with conference center, a bridge connecting to the main tower, and an exhibition hall; two smaller apartment towers of 173 and 166 meters; and the main tower, containing an array of office accommodations and a luxury hotel. The overall design of the complex interprets and integrates Chengdu’s urban structure and local culture, representing the modern embodiment of Chinese traditional feng shui theory. 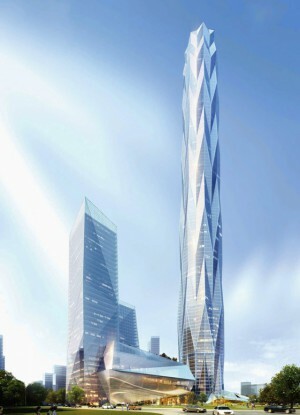 The form of the tower was inspired by the unique ice mountain topography around the city, with an angled, mountainous façade that emulates the cool bluish hue of the rocky formations in deep winter. Like the mountain ridges reflecting the light of the sky and the valleys reflecting light from the earth, the tower will perform as a light sculpture to diffuse light from 360 degrees, creating a connection between the ground plane and the sky. A series of inset LED lights along the exterior will enhance this effect at night, causing the tower itself to be an enduring visual centerpiece for the larger development. Chengdu Greenland Tower’s architecture and structure are married perfectly. The design fully considers the structural requirements of a supertall building in a high seismic zone, using a geometrical plan, a tapered form, and a high-performance damper bracing system to ensure the structure’s stability and efficiency. The building also features an allotment of high-efficiency sustainability systems, including high-performance glass paneling on the exterior.